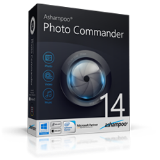 Ashampoo Photo Commander 14 was available as a giveaway on November 10, 2017! How would you improve Ashampoo Photo Commander 14? Hi again, mixed feelings I'm afraid.. I think I simply forgot how cumbersome this Program can be! First of all is does a lot of 'Not responding' and has to be forced to close down, that's bad, really bad! Secondly - the GUI (at least still in Version 14) offers only two very basic (generic) Skins, both looking rather old and tired, sorry! Next - that 'undo button', something used a lot in Photo Programs, can so easily be confused with 'rotation arrows' resembling undo/redo shape and form, both on the same bar above the picture, annoying!.. 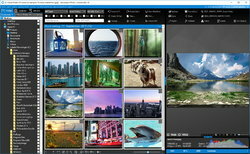 To add to this - artistic Section (Create) with it's Framing Feature - STILL doesn't know how to automatically fit the image in frames - without user having to crop picture manually? Fiddly, annoying, wrong to offer in this rather 'unfinished' design in a first place!.. For that asking price?? Something else. Photo-Commander pushes on user far too many 'file associations' (pre-ticked boxes) that have to be later examined and/or manually undone if someone is used to different Programs opening these image/video/audio Files? Perhaps understandable, but again too predominant for anyone's taste!! 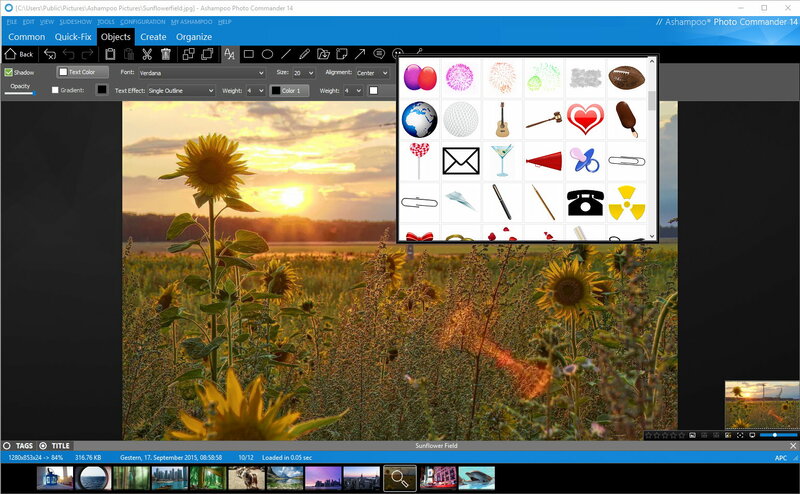 Here - after installing PC14 and double-clicking on random image File on desktop for instance - took me straight to my.. Adobe Photoshop! Where did that come from?? I had Corel PSP set for that job.., and many other Photo Programs installed in a meantime that didn't alter my preferences in such manner.. These are my personal impressions and dislikes, but still - Program is packed with enough other decent features to be kept and used.. Now and then in my case. Hi again, mixed feelings I'm afraid.. I think I simply forgot how cumbersome this Program can be! First of all is does a lot of 'Not responding' and has to be forced to close down, that's bad, really bad! Secondly - the GUI (at least still in Version 14) offers only two very basic (generic) Skins, both looking rather old and tired, sorry! 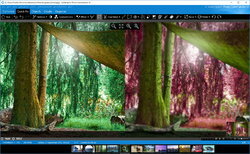 Next - that 'undo button', something used a lot in Photo Programs, can so easily be confused with 'rotation arrows' resembling undo/redo shape and form, both on the same bar above the picture, annoying!.. 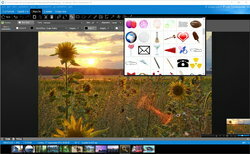 To add to this - artistic Section (Create) with it's Framing Feature - STILL doesn't know how to automatically fit the image in frames - without user having to crop picture manually? Fiddly, annoying, wrong to offer in this rather 'unfinished' design in a first place!.. For that asking price?? Something else. Photo-Commander pushes on user far too many 'file associations' (pre-ticked boxes) that have to be later examined and/or manually undone if someone is used to different Programs opening these image/video/audio Files? Perhaps understandable, but again too predominant for anyone's taste!! 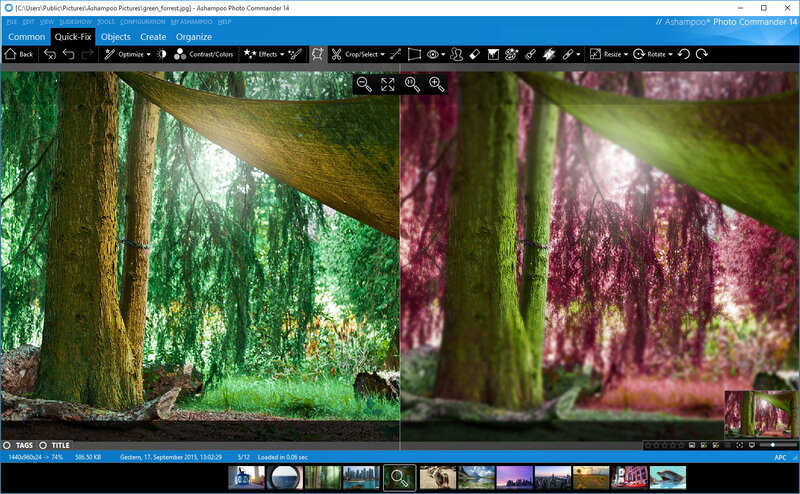 Here - after installing PC14 and double-clicking on random image File on desktop for instance - took me straight to my.. Adobe Photoshop! Where did that come from?? I had Corel PSP set for that job.., and many other Photo Programs installed in a meantime that didn't alter my preferences in such manner.. These are my personal impressions and dislikes, but still - Program is packed with enough other decent features to be kept and used.. Now and then in my case. 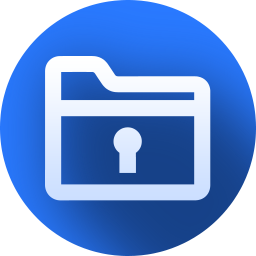 When you install it, it requests a License key. I just did all of the above in my XP Pro 32bit system, and it installed fine. Installed OK. I keep getting pop up ads for more and more Ashampoo products that I "must have". Well, I must not and have uninstalled this. Will just rely on whatever Photoshop can do for me. Very disappointing but as i recall, i stopped using Ashanpoo products years ago for this very reason. Wow. Far too many troublesome steps just to activate license. Like many have complained, Have requested license code several times, several hours later still nothing. Wow. Far too many troublesome steps just to activate license. Like many have complained, Have requested license code several times, several hours later still nothing. Whole thing downloaded, set up and running within 10 minutes. No problems getting email code which arrived almost immediately. Great little program, so easy to use with great results. Whole thing downloaded, set up and running within 10 minutes. No problems getting email code which arrived almost immediately. Great little program, so easy to use with great results. Have tried to obtain the license key and am having no luck. I have been downloading program fro GAOTD for years now. Lately however I am having problems with activation. Hate to admit it but Its getting pretty frustrating trying to use some of these programs lately. Today I found the download took 8 mins and I normally have 400 Megs Down, I am not sure why today but the cable company has been screwing around here for 3 days? I had to re-register my email address with Ashampoo but even there I was able to verify and get my activation code within 5 minutes. The program it self is a keeper much the same as a number of Ashampoo software is. My Op Sys is Win10 Creators Edition. Are you sure it won't work on XP? I've tried two email addresses, and I haven't received an email with the pass code; now 2 hours later. Pretty disappointing. I don't know what you people are doing wrong but I received the e-mail in less than a minute! Another great Ashampoo's product. Thanks. Password change worked for me as well. Just realized I have some previous Ashampoo software. Thanks for the tip. Andrew C Potts, Password change worked for me as well. Just realized I have some previous Ashampoo software. Thanks for the tip. Despite several attempts,no activation code received. Checked spam box too but nothing. PC - Software - Tricks, Already have a free Ashampoo Account.Tried your suggestion but just got invalid message.I see from other unhappy users that they are also experiencing similar problems.I have sent an email directly to Ashampoo but no reply to that either although they acknowledge receipt. I've not tried this offering for Photo Commander. What I do know is, anything Ashampoo has is a great product. You will never be sorry you try their software. That said, except to see their sales pitches when you open the program and emails from them. For what your getting, it's worth it. Thanks to everyone, at GOTD and Ashampoo. Giveaway of the day: "Get a registration key" doesn't funktion??? Dude, win 7 came out in 2010. A 7 yr old pc is old.